Potash Road just outside of Moab has many wonderful roadside attractions. 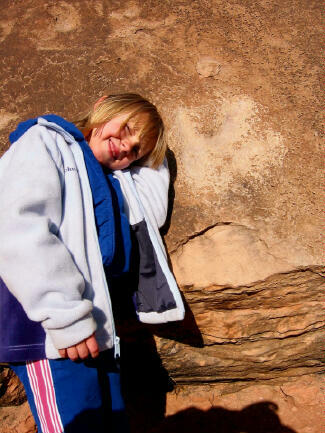 Some of the best attractions are two large panels of petroglyphs and several dinosaur tracks. This is an adventure everyone can enjoy. The Potash Road Petroglyphs are not a hike but a road side attraction. The rock art can be viewed from your car, which makes this adventure accessible to everyone. The Potash Dinosaur tracks require a 200-yard stroll across a rocky hill side.Total time required for this adventure starting in Moab is 1 to 2 hours. There are no fences or guard rails at these sites. You are the protector of this environment. Navigation for this adventure is easy. The attractions are well marked. A GPS is a waste of time, but I have included the important waypoints for the gadget heads. 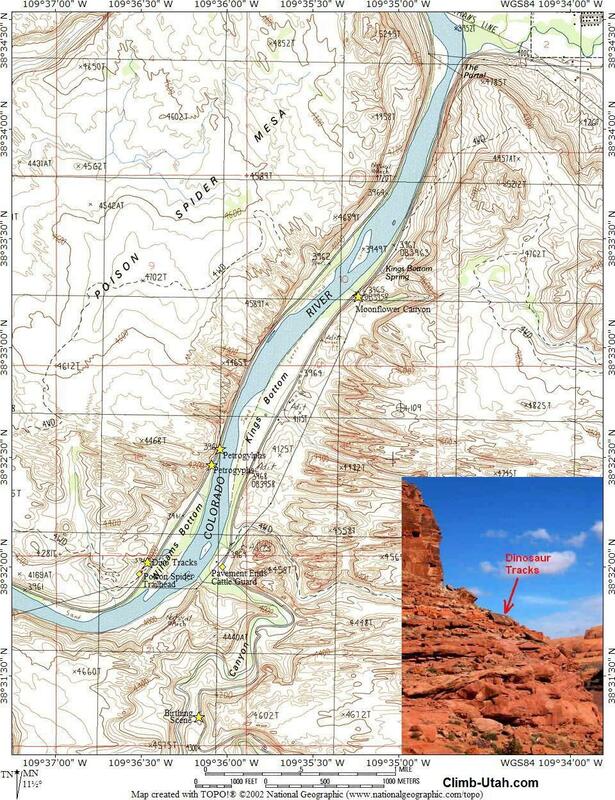 The USGS 7.5' Map titled "Moab" covers these attractions. You should have no problems completing this adventure using only common sense. There are several nice BLM campgrounds on Potash Road along the Colorado River. For more information or for reservations, please call the Bureau of Land Management Moab Field Office at (435) 259-2100. Archaeologists believe that most the petroglyphs were done by Indians of the Southern San Rafael Fremont culture, which flourished between 600 A.D. and 1300 A.D. The Fremont art includes older portrayals of animals, lines of hand-holding men and triangular figures with horns, spears and shields. 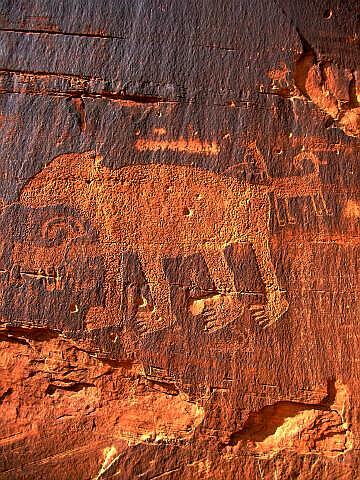 The more modern petroglyphs, including the horsemen and many of the hunting motifs appear to be the work of Ute Indians in relatively recent times. They show less weathering and less attention to detail than the Fremont rock art. These petroglyphs are fragile and easily marred. Please help preserve them for the enjoyment of others. From Moab head north out of town on U.S. Highway 191. Cross the bridge over the Colorado River. After crossing the bridge continue north for 1.3 miles to the signed "Potash" road, which is State Road 279. Turn west (left) and follow State Road 279 for 5.1 miles to a pull-out signed Indian Writing (N38° 32' 32", W109° 36' 02"). The pull-out is on the south side of the road next to the river. Please be careful crossing the road to view the petroglyphs. And additional 0.1 miles west on Potash Road is a second pull-out with more petroglyphs. To locate the dinosaur tracks you must continue driving west for 0.7 miles beyond the second Indian Writing pull-out (6.0 miles total along Potash Road). Turn into the signed Poison Spider Trailhead. The trailhead is marked by a large gravel parking lot, information kiosk and pit toilet. From the Poison Spider Trailhead (N38° 31' 58", W109° 36' 31"), locate the signed trail to the dinosaur tracks that begins next to the pit toilet. Follow the trail east for 200-yards as it zig-zags up the ledges to the flat rock with the most visible dinosaur tracks (N38° 32' 01", W109° 36' 28"). 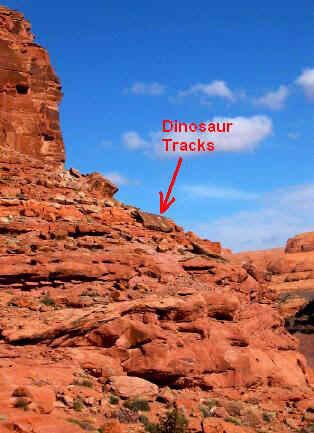 If you look around you will notice that several similar rocks in the area also contain dinosaur tracks. From the dinosaur tracks follow the trail north as it climbs to the base of the cliff where you will locate several really nice panels of petroglyphs (N38° 32' 02", W109° 36' 30"). At the west end of the petroglyph panels you will find a second large boulder with dinosaur tracks. Because you are good parents and I would hate to see your children out hunting dinosaurs illegally I have provided you with a method to download your dinosaur hunting license. 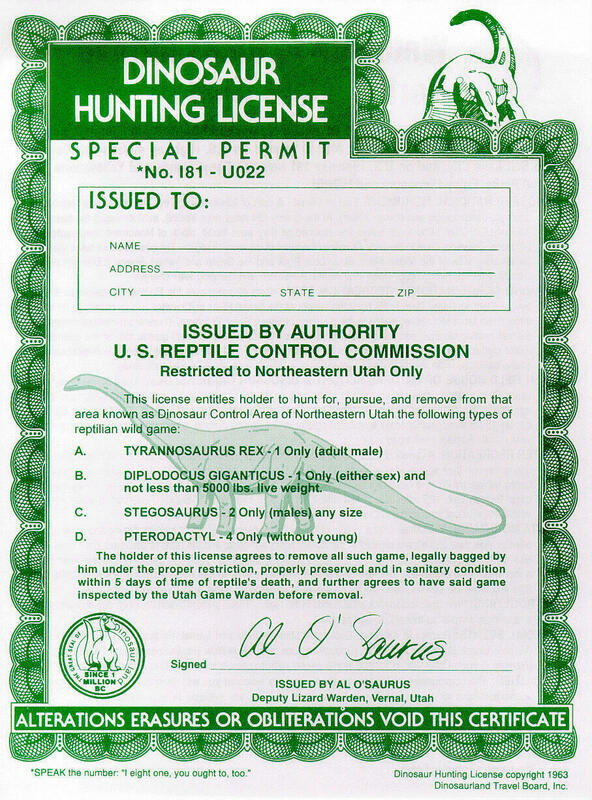 Please download and fill out the license and carry it with you at all times while hunting dinosaurs.